It always comes as a surprise to me when I travel in countries that have as their minority religion, Christianity. Don’t get me wrong. I find it sweet and amusing. In fact it goes a long way in representing the basis upon which Hinduism and Buddhism are founded. Having a visible splash of Christmas in a Buddhist nation where almost none of the locals celebrate the 25th of December underscores their non-judgmental, open arm doctrine of religious understanding and tolerance. Even though 90 degree weather and Santa costumes are hard to reconcile they do go hand in hand with the chaos and energy of Cambodia. Santa came to this vibrant country and left a bunch of his outfits to add just a little more color and a splash of goodwill…mainly for expats and traveling foreigners but even so; how nice is that! I love this and your take on it! I love how open they are. It’s the same here in India. And our little suburb of Bandra is as Christmassy as any other place around the world! 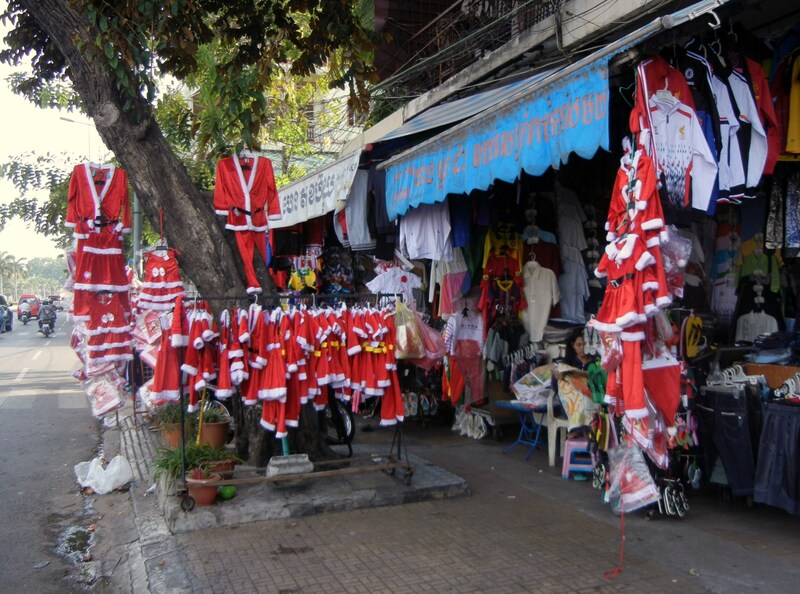 Santa in Cambodia – I am not sure how comfortable it would be to wear a Santa suit there (it may be pretty hot). I think it is the same in most of Asia. You can find lots of Christmas decorations in Taiwan as well and major businesses have also gone all out creating huge displays. I wonder what they do with all the Santa suits they don’t sell? Very interesting concept, didn’t know Cambodia would’ve jumped aboard the Xmas festivities. Yes, I know the feeling. On big trips a little taste of home is nice…every now and then. Hello Tim, It is nice that you got the look of Santa clothes while you are away from your country. 90 degree is normal for them but it can be surly surprising for you to have a Christmas without snow. These are all different colors of nature and I feel you are there to compare the difference and experience it. I hope you will have a great day on 25th Dec. All the best. I agree it is a little strange to see this combination. I was in Japan and there is the Hotei-osho, who is a monk that acts like Santa. Seeing these things, kind of throws you off a bit. I agree, 90 degree weather always seems a little strange for Christmas, but I know that’s normal in many parts of the world. Those santa suits brought a smile to my face! Merry Christmas! I remember the first time I went home to NZ and even that felt strange because it was warm; I had been spending my adult Xmas’s in either London or Chicago. Been to Cambodia but not during Christmas! This is cool! Merry Christmas to you!! If we will be in Cambodia again, I just want to chill in Otres Beach in Sihannoukville! Yes, I stayed there and upon return will stay there again. I find that non Catholic countries/people tend to be a lot more tolerant towards other religions as well. Finding Santa outfits like you have tells me (correct me if I’m wrong) that they are fast to see business opportunities and they have learned to be flexible 🙂 That being said, have a Merry Christmas (if you celebrate the Holiday)!!!! I think you are absolutely spot on with that assessment. Christmas in Cambodia! How cool is that? So glad you get to experience it. Happy Holidays! I cannot imagine celebrating Christmas in hot weather. I am sure it would be nice but I cannot picture it. It looks as though you enjoyed your holiday as per usual. How interesting. I wonder if they are for tourists or for Christian transplants in Cambodia? Needless to say, it must be interesting spending the holiday time of year in a place that isn’t very “Christmasy” on many different levels. 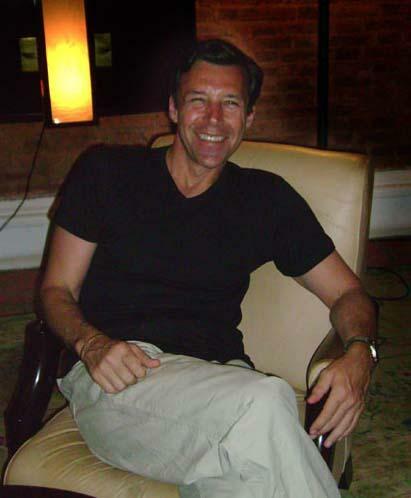 I live in Los Angeles which is not quite as warm as Cambodia this time of year, but it is a sunny 77 degrees today. I think there would be massive bouts of fainting if we were to wake up to a white Christmas! Happy holidays! I initially got the feeling that it was mainly for the tourists but then why would a tourist buy a tiny santa outfit. There was definitely a Christmas theme running through the central city with sleighs and candy cane and snowflake ornaments etc. Adds to the wonderfully bizarre and exciting vibe the city has. What the world needs is more stories of religious tolerance. Enjoyed the pictures and the season-appropriate post. Well I am in Oaxaca now and it is quite hot. It doesn’t really make sense to see Christmas trees and Santa Claus around, despite it being a Catholic country! I think I would be have been surprised to see Christmas celebrations or decorations in Cambodia too. Having grown up and lived my whole life in Canada, with snow and cold at Christmas, the first time I celebrated Christmas in a warm place, it felt odd. I’m more used to it now. Santa in Cambodia isn’t a sentence I thought I’d ever come across! We’re just back from South Africa where I always find it odd that they have all the tinsel and decorations but it’s a sweltering 40 degrees, and most have never seen snow! Thanks Jacquie; I feel the same about this picture now as when I first took it. Me and my husband were talking the other day about the sometimes strangeness of the “Christmas” you find in other counties who don’t celebrate it in the way we do. Such as Japan and their KFC! It’s great that we can all take it how we want to and celebrate it as an event to get together and not just religion. Have a great Christmas! Yes, I do often overlook the fact that not all countries celebrate the festivals we do in Singapore, which make me appreciate the fact that Singapore’s a multi-racial and multi-religion country! It means more public holidays too! This is one place that I wish to go so bad! The photo section is incredible, beautiful pictures! Hope you had a merry Christmas Tim. A very Merry one; and you to. Get on with a market ready santa suit! Hey Dan, glad your still with me. Hope all is well and a very Merry Xmas to you guys…and a Happy New Year. Do you want one of these suits; might be a bit small.